Today, if everything goes as it is supposed to be, I am in Valencia. We probably woke up early and had a tour of the Mercado Central, bursting with life and colours, and now we are probably mesmerized in front of the majestic Calatrava’s City of Arts and Sciences. It’s just a short three day trip, everything we needed to begin the new year with fresh air, new flavours and some Spanish warmth, which is so good for your soul. Tomorrow we will be back home, but today, on January 14, are in Valencia. Today is also my mum’s birthday, so I thought I’d wish her happy birthday from here. I know that she will read my blog this morning, I can almost see her sitting in the dim light in a corner of our living room at the computer. Every day, in the early morning, she reads quickly the news and my blog before going to work or before cleaning the house, loading the pellet heater, chasing Noa who runs away with a bag of Wolfi’s food, cooking lunch or dinner, trimming the roses, going shopping with grandma, reading a crime story or speaking at the telephone with my aunt. Mum is a regular here on the blog, you have already met her in many recipes and stories. She is modest, stubborn, generous and selfless, she loves reading crime stories and taking care of her roses in the garden, even though you can not exactly say that she has a green thumb (she’s been able to kill a huge and old ivy for her drastic trimming). She has a big heart, even if she’s a tiny mum: when I was fourteen I was already taller than her, but I kept searching for cuddles and protection in her embrace. Mum works in a kitchen every day, she has hands of a working woman, as she also takes care of the garden, the wood for the fireplace and the stoves. Her hands are marked by work and time, but those hands give the softest caress. I’m so proud of her, but I am not sure I said it enough. So mum, I know you are reading this post, this is for you: happy birthday with one of your favourite cakes! I have finally become familiar with my sourdough starter. The only way to learn is by trial and error. At this, I am very good: I baked bread loaves hard as a brick and a panettone with the density of an English fruit cake, but I have not given up. So I started to try and try again each recipe until I was satisfied. Now I can proudly say that I have my recipe for a durum wheat bread loaf and my recipe for a torta di rose, literally rose cake, a cake made of brioche rolls arranged one next to the other as to resemble a rose bouquet. This is one of mum’s favourite cakes. To make my durum wheat bread loaf I just followed my instinct, mixing good flour, water and starter until I was happy with the result. 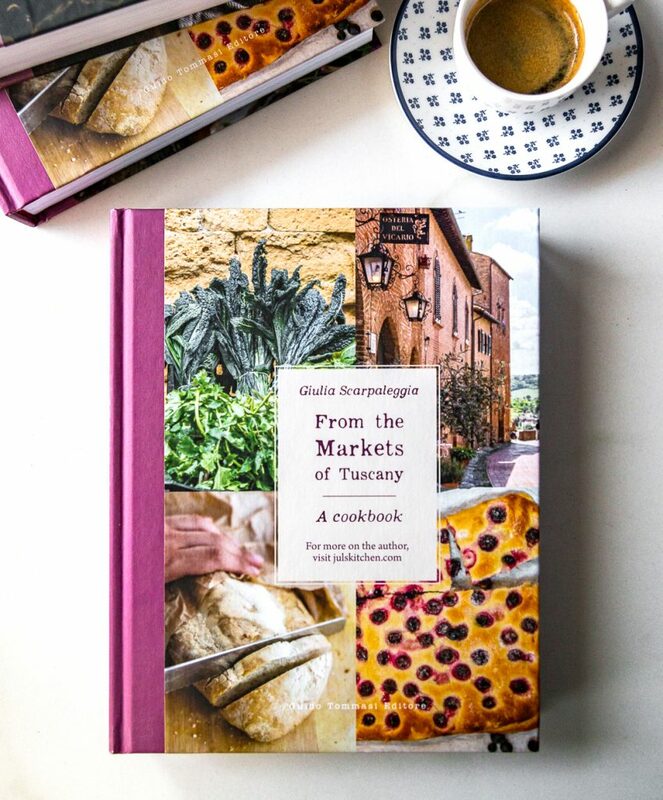 When it came to baking a spectacular brioche, I decided to start from the very same cake which, years ago, had been my first successful attempt of a sweet bread with fresh brewer’s yeast. So this time I started from this recipe. I made it four times in a few weeks and tried it with milk, almond milk, ricotta and mascarpone, but this is the version that made me happier. 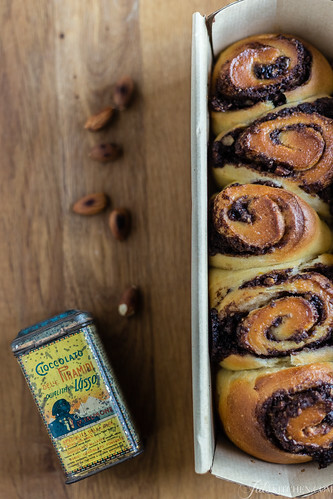 When I held the little almond and chocolate roll in my hands, still warm from the oven, I started squealing, I could not believe my eyes, it was exactly what I was searching for. 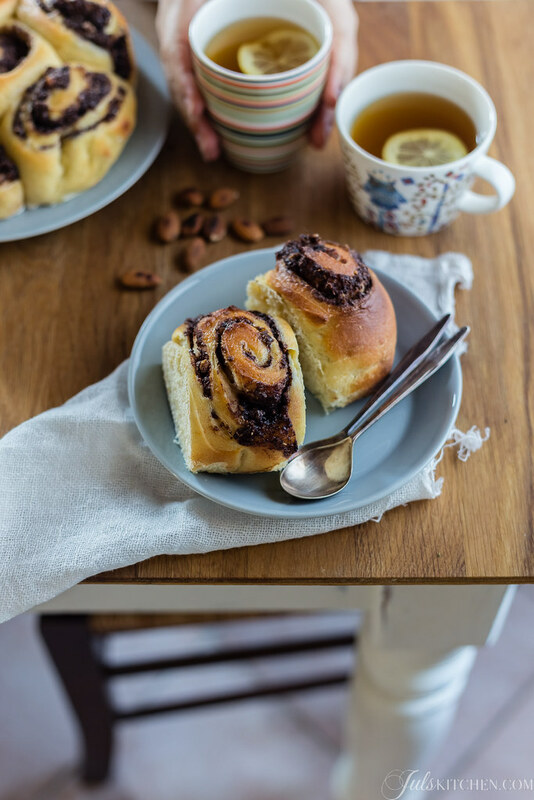 Now this is my recipe for when I feel like baking a soft brioche, making a cozy breakfast or surprising my mum with one of her favorite sweet treat. 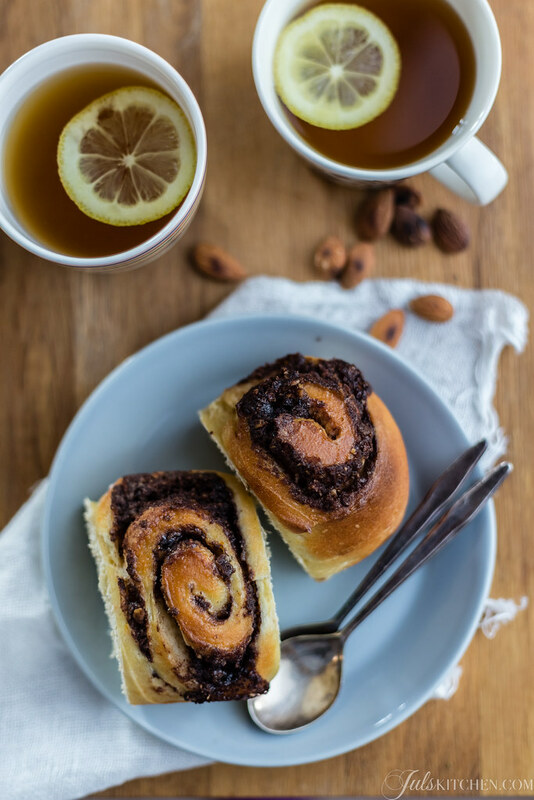 You can arrange your rolls in a traditional round pan, in a rectangular loaf tin or even in single muffin moulds: the result are small chocolate brioche rolls, perfect for your breakfast, for an afternoon treat with a cup of tea or to sneak in your bag for a sudden hunger attack. Warm the milk on low flame and add one tablespoon of powdered milk: stir to dissolve. Put the starter in a large bowl, pour in the milk and whisk to melt until you have a smooth batter. Add gradually the flour and the beaten eggs with ricotta, mixing continuously. Now add the sugar and the grated orange zest. Salt will be the last ingredient to be added. Knead by hand or in a stand mixer for about ten minutes. Finally incorporate the butter at room temperature. Keep kneading until it is evenly mixed, then scrape the dough onto a generously floured surface. Gently flatten the dough, fold it in three parts and form a ball. Put your dough in a tall, narrow container and let it rise in the oven with the little light on for about 2 - 3 hours, then store it overnight it in the less cold shelf of the fridge. Remove the dough from the fridge and bring it to room temperature: at this point it should be at least doubled. Prepare the filling now. 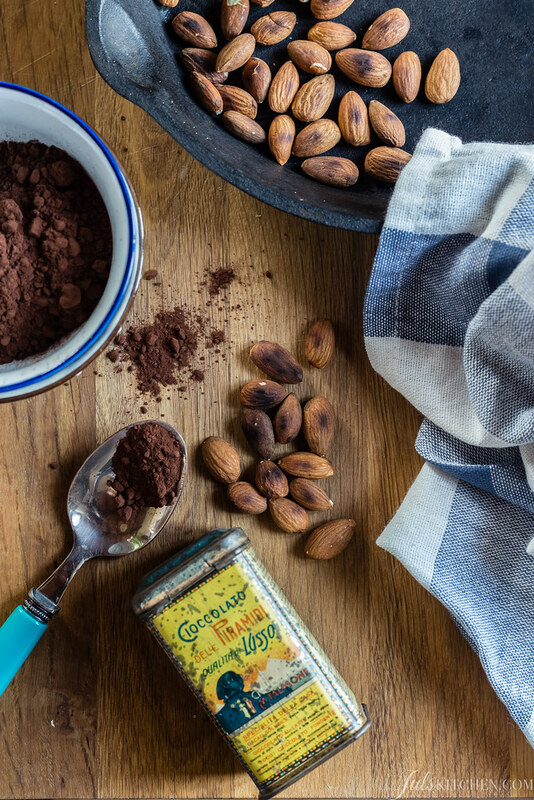 Toast the almonds and blend them with cocoa, butter and sugar. Roll out the dough with a rolling pin and some flour and form a rectangle. 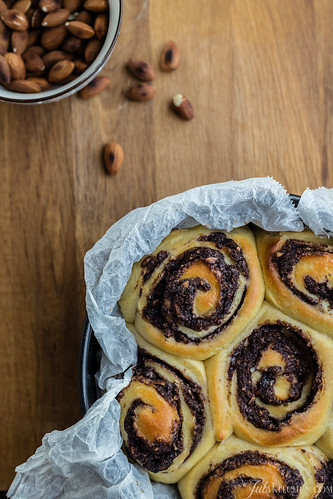 Spread the dough with the almond filling, then roll it up tightly on the longest side. Cut it in about 12 - 14 rolls. Line with parchment paper a 18 round spring form cake tin and a loaf pan and arrange the rolls inside, keeping them slightly apart. Let them rise for at least three hours: I kept them in the oven with the little light on. When the rolls form a cake, remove the pans from the oven and warm it to 200°C (gas mark 6, 400°F). Brush the rolls with a few drops of milk and bake for 20-25 minutes, until golden. *Powdered milk helps the cake rising by adding more proteins to the dough. I baked the cake also without powdered milk and the results were definitely good enough. **In Italy there's a classification for flours which goes from 00 to 0, 1, 2 and wholewheat flour. I chose 2 because it's easier to bake than with whole flour, but it is not as refined as the 00 flour. For more information check this article. what you wrote about your mom, it made me tear up and call my mom! Happy birthday to her, here’s to many many more! Hello Maria, thank you so much for the birthday wishes! Hello! You left the cocoa or chocolate out of the filling ingredients. How much do you use, and can you edit the recipe to include it so we all can print and try to make it ourselves? Thanks! Thank you for noticing the missing ingredient! 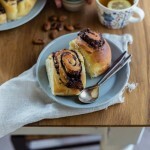 I just added it to the list, now you can print it and try the brioche buns! Happy baking!